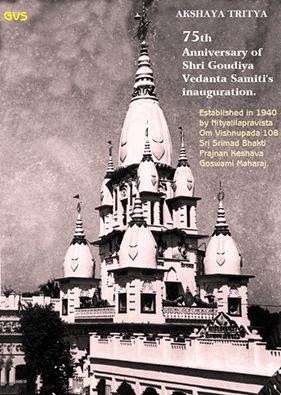 Today is the 75th Anniversary of Shri Goudiya Vedant Samiti's (GVS) inauguration. GVS was established in 1940 by Nityalila Pravista Om Vishnupada 108 Sri Srimad Bhakti Prajnan Keshava Goswami Maharaj for the practice and preaching of pure devotional service in the preceptorial line of Srila Bhakti Siddhanta Saraswati Thakur Prabhupada. Currently GVS has more than 45 Branch Maths/preaching centres in India.